Two Chicks Farm is owned and operated by Audrey Lin and Debbie Donnald. The small farm was established when layoffs forced us to take a leap of faith and seek a way to work more in tune with our beliefs. We have always gardened, cooked and searched out ways to eat healthier. Eating good quality food and being good stewards of the land have always been driving principles in our lives. Taking those principles to the next level we started using vegetables grown by us and from local organic farmers to make our krauts, kimchi, pickles and pepper jellies. We are truly farm to jar. Two Chicks Farm originally was a market garden business and we sold fresh vegetables at local farmers markets. After a couple of years, we decided to add value added products to what we sold at the markets. As these products became more popular we stopped selling our fresh vegetables and started growing solely for the krauts, kimchi, pickles and pepper jellies. Audrey was an engineer in her former life so she is a bit of a tinkerer which comes in handy when trying different recipes. 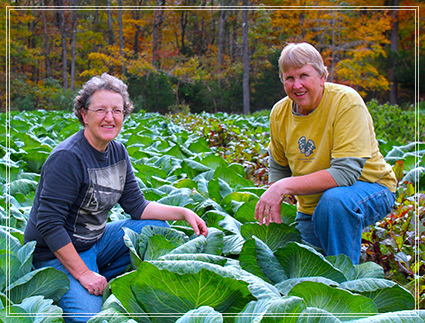 Debbie enjoys researching and learning whether it be the best variety of cabbage to grow or the best source for organic spices. We make a good team. Taking our past job skills ranging from process engineering to working at a garden center along with living in interesting places from Hillsborough, NC to Austin, TX we have used these life experiences to develop our business. Click here for some great serving ideas!